Looking through my recent reads, I noticed a few interesting patterns. 1. I gravitate towards books with multiple storylines and points of view. Perhaps that’s why I chose that structure for my upcoming debut novel, which follows a mother and daughter with alternating points of view. 2. If the stories take place in different time periods, it’s even more intriguing. This one doesn’t apply to my writing. For me, creating a novel is difficult enough without adding the need for exhaustive research to make the historical details correct. 3. Many of my reads feature strong female lead characters who make bold choices and strive to improve the status of women in society. Yes, my book follows this pattern as well. Let me start by saying that I adored this book. The story follows two women in New York City: Charlotte in the 1940’s and Olivia in current day. Living with her controlling parents in Brooklyn, Charlotte is finishing college and hopes to land a job at an advertising agency. She dreams of being the first woman to climb her way out of the typing pool to become an account executive, but her aspirations go far beyond what gender roles allows. Her goal seems impossible until she applies to be a model for the Miss Subway ad campaign, a choice that changes the direction of her life and her future forever. In present day New York, Olivia works for a boutique advertising firm, has a crush on her boss, Matt, and has to deal with obnoxious comments from her misogynistic coworker, Thomas. While researching for a campaign pitch for the MTA, Olivia discovers the former Miss Subways campaign. Instantly captivated, she brainstorms ways to update this idea for the modern sensibility and highlight the lives of these women in a fresh and more empowering way. Though the way the two women’s stories intersect is a bit coincidental, it didn’t bother me because Schnall’s writing is so smart, funny, and engrossing. I devoured this book in a few sittings and was riveted right up to the sweetly satisfying ending. This gorgeous novel follows the lives of three women: Vera, a German immigrant living in the garment district in the early 20th century, Vera’s wealthy suffragette friend, Pearl, and Vera’s daughter, Alice, later during the second World War. Despite their varied backgrounds and stories, all three women struggle with what it means to be female during their time in history. Pearl is strong and outspoken, traveling the country to advocate for women’s right to vote. Vera and Alice are not quite as vocal, but they wrestle with similar challenges and questions. How do they find a partner whom they love but who also allows them to retain their individuality? Where and how will they make their mark? Will women ever have the same choices that men have? Di Maio’s meticulous research and evocative descriptions bring the story to life, and the setting in the shadow of the original Penn Station's former glory ties all three stories together in a clever and beautiful way. Fair warning: This is the kind of novel that rips your heart out of your chest and pulverizes it in the blender. Once every few months, I find this type of book cathartic. If you do as well, then then read on. Much like "Oliver Kitteridge" by Elizabeth Strout, the novel tells the story of a poverty-stricken Appalachian mountain town with each chapter told from a different townsperson's point of view. Some of those we hear from include Gladys Hicks and Marris Jones, two elderly women friends, the local preacher, his uptight sister, the new schoolteacher, and Roy Tupkin and Billy Barnhill, childhood friends who spend their days drinking and getting into trouble. But the first and last words belong to Sadie Blue, the true heroine of the story. Sadie’s life has been a constant struggle. Abandoned by her parents and raised by her tough-as-nails grandmother, she marries Roy Barnhill when she learns she is pregnant with his child. Less than a week after the wedding, the physical abuse begins and doesn’t stop. Through the rotating viewpoints, we learn more about both the personality of the town and Sadie’s situation. As time passes, Sadie gains maturity and strength, right up until the magnificently plotted and fitting conclusion. Weiss is from the south and did an incredible job making the characters' voices authentic and distinct. With such a remarkable debut, I will be sure to keep my eye out for what Weiss writes next. Here are some other buzzy spring books with a feminist bent or strong female protagonists. I haven’t read these yet, but they are squarely on my radar and will hopefully make it to the top of my TBR sooner rather than later. 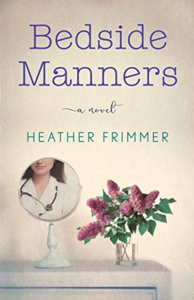 Heather Frimmer is a radiologist by day and an avid reader and writer at all other times. Her debut novel, "Bedside Manners," will be released by SparkPress on Oct. 16. It is available for preorder here. Visit her at heatherfrimmer.com.